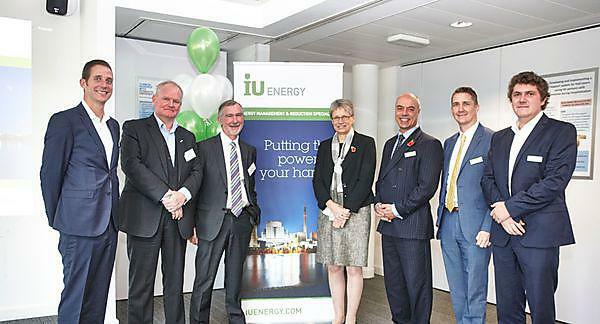 Leading energy consultancy, IU Energy, and mechanical and electrical engineering specialists, Amer, have officially celebrated their merger in the company of senior political, academic and business leaders at Plymouth University. The newly combined company, which continues under the IU Energy brand, sees the two South West based organisations join forces with specialist skills in energy consulting, procurement, installations and maintenance with clients across the UK. Both companies enjoy a national reputation for their work with IU Energy recently advising a number of its 1,500 commercial clients on compliance with EU’s Energy Savings Opportunity Scheme (ESOS). Meanwhile Amer has established a strong reputation in the agriculture, education and manufacturing sectors for its specialist installations and maintenance using combined heat and power, biomass, ground and air source heat pumps and solar PV technology. IU Energy also enables its clients to access capital funding through a comprehensive range of financial providers. These include finance schemes for both commercial and public sectors. In addition, its buying power is boosted through Tier 1 broker status with the UK’s major energy suppliers. The deal sees Amer directors Liam Reed and Ben Thomas become directors of the newly merged company alongside CEO Duncan Banks and MD Chaz Lawrence. Foot Anstey Partner Ken Lewins advised IU Energy on the deal.